I am now offering intense "Beat the Heat" Blackjack Card Counting training seminars and Advantage Play training courses for casino personnel who want to master the art. I will teach you the exact same card counting and tracking methods taught by the ex-MIT Blackjack Team members, but with an added invaluable element that makes my card counting courses better. I will really show you how counters BEAT THE HEAT while they're playing in casinos. Card counting systems are not difficult to learn. What makes good teams and individual players successful is the ability to play "clean," without taking heat from the pit for as long as possible. This is their TRUE specialty. Because of my unique intuition and knowledge for sniffing out heat and the right playing conditions in blackjack pits, I was able to cheat casinos for 25 years without ever getting caught. I will relay this know-how to you. I will also teach you the special tricks the MIT guys and other highly-trained advantage players use to disguise their play from card-counting detection software. I will teach you the new modern strategies that are implemented to camouflage advantage blackjack play. So if you want to learn how the world´s most sophisticated advantage players and counters operate, I'm the guy to teach you...PERIOD. My card counting seminar class prices are less than the Blackjack Institute MIT card counting courses, and I come to you. For group seminars held in selected cities, the price of admission is $500. If you are interested in attending, please contact me and I will give you details about upcoming seminars in your city. For those of you who cannot attend a seminar, I also conduct private lessons via Skype. The price for the full 4-day course is $500. A modified 2-day course is $200. For private lessons on demand inside casinos, I charge $5,000 for a one-day card counting course or $8,000 for a two-day course. All of these on-site card counting and advantage play courses can be attended by one to ten persons, the prices remaining the same. I will come to YOUR location and pay all my travel and lodging expenses if the card counting courses take place in North America. For other locations there is an additional travel and lodging cost of $1,000. The card counting and advantage play courses will be held in a hotel conference room as well as inside the casino. My card counting and advantage play classes will provide a full day of expert instruction and hands-on training. Not only will you be taught the art and science of card counting, you will also have the opportunity to ask questions and apply what you learn in break-out card counting practice sessions at multiple blackjack tables. 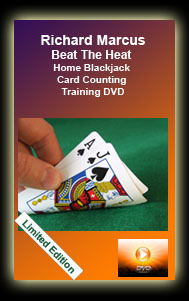 I will also detail a virtually unknown and undetectable "Beat the Heat" card counting method. Read about it here. My card counting and advantage play courses will also provide you with everything else needed to know for the protection of your operation--from how to spot the way pro blackjack players dress to how they enter the casino to how they obtain your chips to how they approach the table to how they conduct themselves at the table to how they leave the table and, most important, how they carefully cash out your chips and other essential information pertaining to your chip inventory, especially when they work several different casinos in the same gambling town.